First, our current layout. Our bathroom is long and narrow. Currently, the left-hand corner directly inside the door is partitioned off and hiding the HVAC system. This is also where our unhelpful laundry chute hides. To the right of the door is a half-door which opens to a linen closet accessible through the hallway as well. 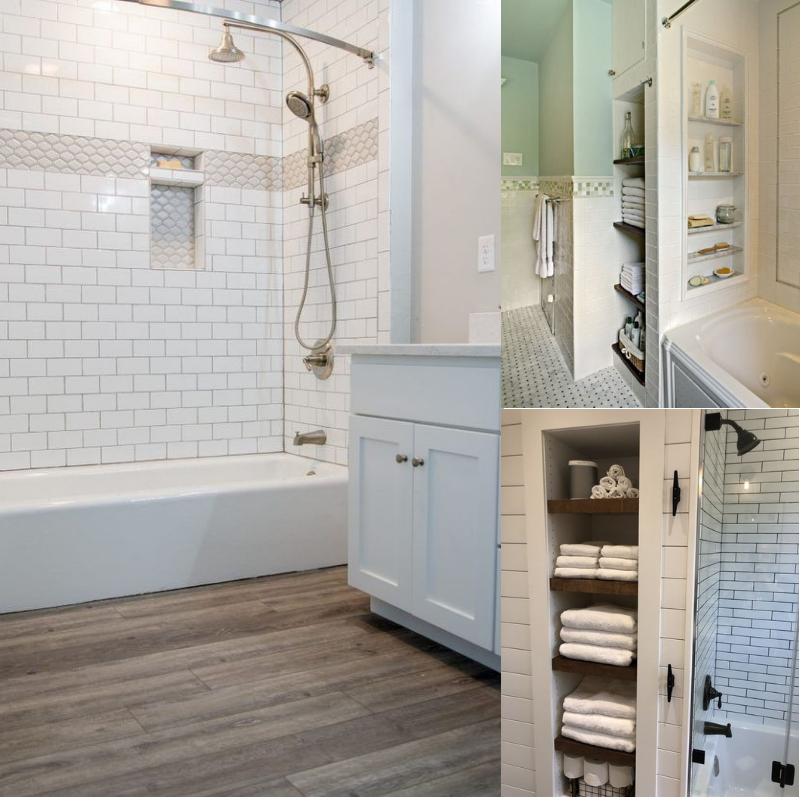 The walk-in tub takes up a lot of space on the right wall as well, and a small vanity and toilet sit on the left wall along with a medicine cabinet and wall shelving unit. The walls are wallpapered with a floral design, and the flooring is laminate tiling. 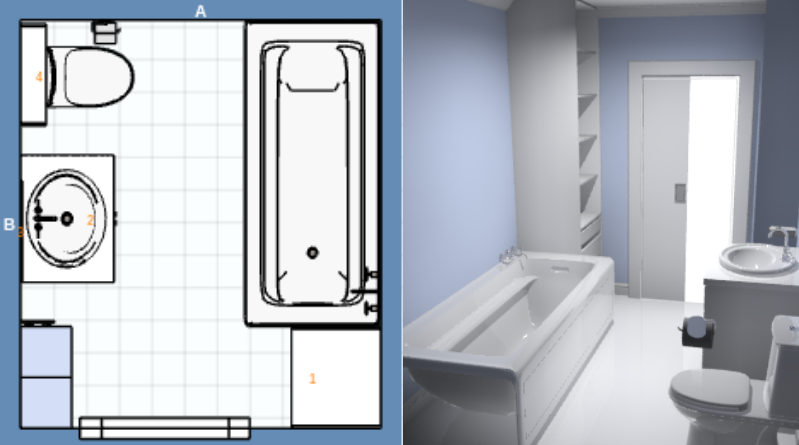 The pictures above are proportionate to our bathroom’s measurements and show a very simple layout of what we are seeking. I would like to eliminate the laundry chute altogether and have the wall directly to the left of the door painted and blank. Being the bathroom is long and narrow, the space is limited and I want to make the room feel as large as possible. 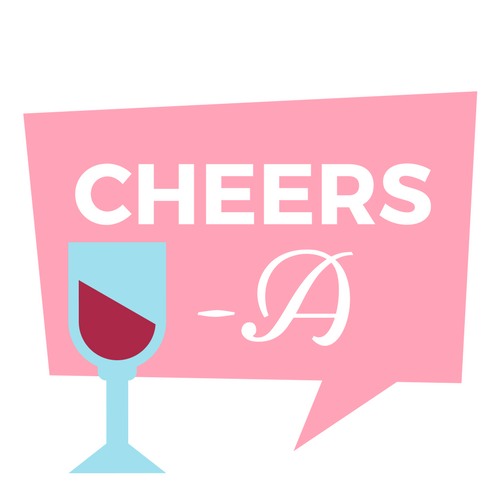 This means we are aiming for as much openness and lightness as we can create. The walls will be painted a light bluish-gray and the flooring will be the same as throughout the entire house: light pine with streaks of gray. As we move into the bathroom, to the left will remain our vanity and toilet. We were leaning more towards a dark walnut vanity, but after perusing Lowes’ options and tackling Pin after Pin of bathroom-scapes, we decided to find a white vanity instead. We want to keep in mind that we’re aiming to make the bathroom feel larger than it is, and the dark cabinet would make for a shock with a white toilet and white bathtub at the base of the room. We felt white was more subtle to the overall ambiance. G likes vanities which have symmetry and bases to the ground for easier cleaning purposes. I, however, am liking styles more like the one in the bottom right-hand corner above. 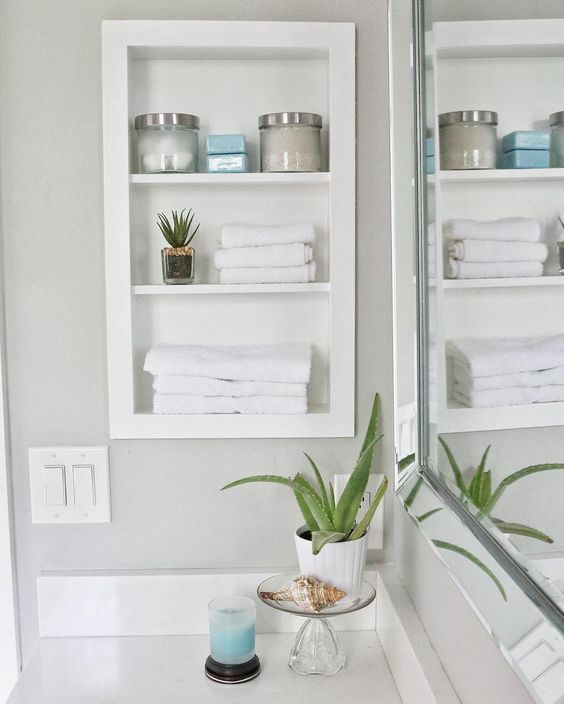 I can see a very cute basket with towels resting on that lower shelf — ideal for my inner-host to squeal with joy. We want to have a large mirror above the vanity. Though we’re torn if this should be a darker tone or brushed nickel like our hardware. As our theme in the bathroom is outdoorsy, I am looking for a frame that is rustic-esque. Above the mirror would rest a light, and I am really digging the fixture above because it looks a bit like candlelight. 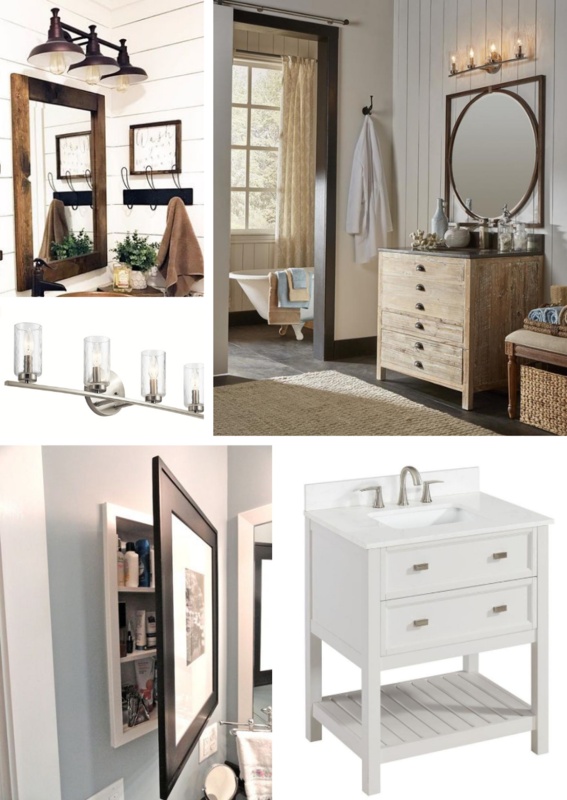 With our hardware brushed nickel, the bathroom’s ultimate color scheme will be cool and relaxing. To the left of the vanity and mirror will be a recessed medicine cabinet. I am trying to decide if I prefer the picture hiding the cabinet or the open cabinet. Hmm… what do you think? 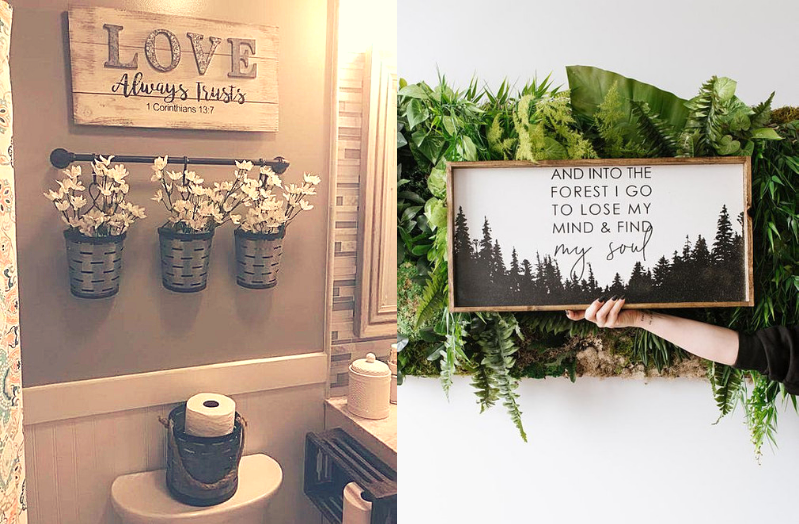 I have never been a huge fan of shelves above the toilet and would rather have the wall decorated with a cute outdoors-themed sign and greenery. I’m loving the simple flower pails in this image and could easily replicate this to add some texture to the bathroom. Moving on to the right side of the bathroom, we will find a soaking bathtub and shower. We plan to encase the shower in white subway tiles and have a recessed shelving unit similar to the larger one pictured below. Directly to the right of the entrance door, we are going to close off the linen closet to the bathroom and only make it accessible through the hall. 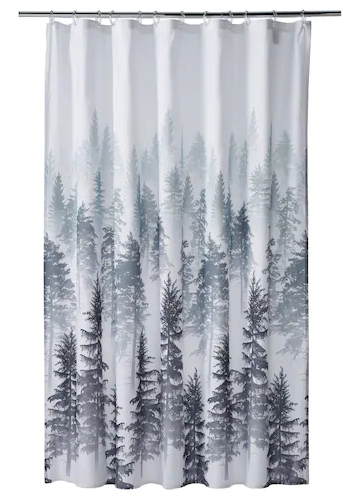 Last but not least, we registered for our shower curtain and received it as a wedding gift. It is so beautiful, and I cannot wait for it to be the final touch to the bathroom. The grayish-blue trees match our wall color perfectly, and the white background will only help with making the bathroom appear larger. I’ll update on our bathroom remodel when we take the first swing of the sledgehammer to the walls. Until then, please feel free to share any advice or suggestions which you feel might extenuate our future bathroom!